General Douglas MacArthur, under orders from Roosevelt, secretly left the Philippines by PT boat for Australia on March 11, 1942, leaving Major-General Wainwright in command. Upon arriving in Australia, MacArthur proclaimed: "I came through and I shall return." 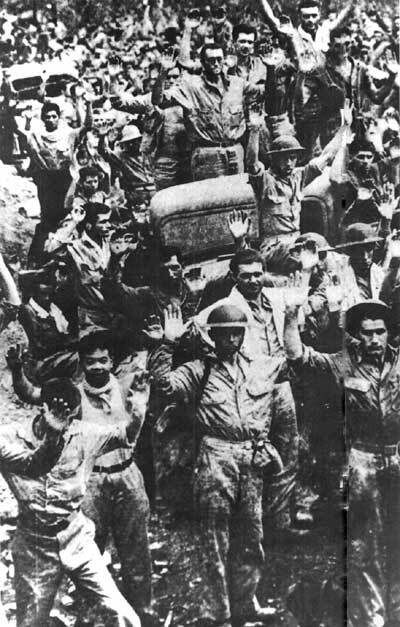 Despite a determined defense by the hungry and disease-ridden American and Filipino troops, Bataan was forced to surrender on April 9, 1942. Almost 78,000 troops were captured by the Japanese. But for the defenders of the peninsula, the ordeal was only the beginning. The "Bataan Death March" was to severely test the resolve of Allied soldiers. Many troops died of exhaustion or hunger, as well as at the hands of their merciless captors during the sixty-mile trek to the prison at Camp O'Donnell. Meanwhile on Corregidor, also known as the "Rock," American and Filipino holdouts were enduring intense day and night aerial and artillery bombardment. When the Japanese invaded the little island on the night of 5 May, they met stiff resistance from American Marines, Philippine Scouts, and civilian volunteers. Although the Japanese invasion force was smaller than the Allied defense, the Japanese managed to land artillery and tanks. On 6 May, General Wainwright surrendered Corregidor, the last American stronghold in the Pacific. The disaster in the Philippines was to become the worst military defeat in U.S. history. The war in the Philippines appeared over. Thousands of Americans and Filipinos refused to obey the surrender orders and continued to fight the Japanese forces in a lengthy guerrilla war that lasted until the American recapture of the 7,000-island nation in October, 1944. One technique used during the early part of the guerrilla movement was to dig road pits. Japanese trucks carrying search parties crashed into the pits; soldiers were killed, and the guerrillas took their weapons and ammunition. This greatly infuriated the Japanese commanders, who ordered their troops to literally chain their rifles to themselves to prevent easy guerrilla access. Beginning in January, 1942, and until the end of the campaign, the guerrillas were also supplied by American submarines, which provided arms, ammunition, and medical supplies. To qualify as a "recognized" guerrilla unit and receive Allied assistance, each guerrilla group had to meet criteria established by the Allied commanders in Australia. 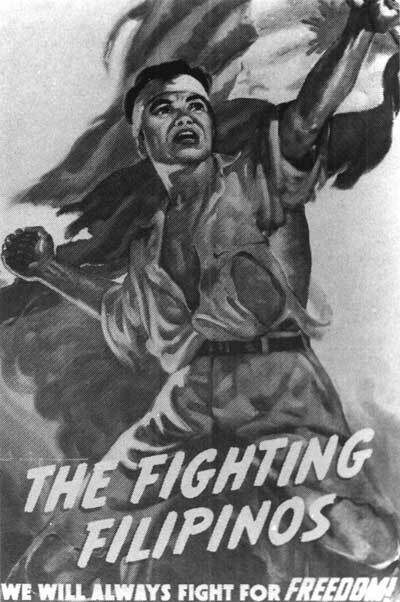 The guerrillas not only harassed the occupying Japanese through hit-and-run raids and sabotage, but also provided invaluable intelligence to the Allied forces.